David Park likes to stay busy. Closer to home, Park will be the featured guest artist on Classical 89’s Highway 89 program. Airing this Tuesday at 8 p.m. (with a repeat at 5 p.m. on March 31), Park will honor J.S. Bach on the occasion of the great German baroque composer’s 333rd birthday with a performance of the Partita No. 1 in B minor for solo violin, BWV 1002. The only other work on the program will be the Fugue from Béla Bartók’s Sonata for Solo Violin. One of the composer’s last works, it was commissioned by Yehudi Menuhin and premiered by him in 1944. 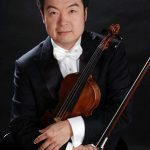 “It’s one of the most important works in the solo violin repertoire,” Park said, adding that it is also one of the most demanding. Two days after his radio recital, Park will play another concert. On March 29, he’ll be joined by violist and Utah Symphony colleague Scott Lewis; pianist and University of Utah faculty member Alex Marshall; and bassist and Brigham Young University professor Eric Hansen. “I’ve been wanting to do a collaborative concert for some time now that brought together members of the three main arts organizations in Utah,” Park said. The program will be divided into solos, duets and a finale that features all four players in two movements from Astor Piazzolla’s “The Four Seasons.” The program will also include music by Saint-Saëns, Handel/Halvorsen, Kodály, Glière and Weber. “It’s going to be quite a diverse program,” Park promised. The concert will be at 7:30 p.m. in Dumke Recital Hall in David Gardner Hall on the U. campus. Admission is free. This entry was posted in Articles, ARTS COMMUNITY, CLASSICAL MUSIC, Concert Previews, EVENTS CALENDAR, Upcoming Concerts by Edward Reichel. Bookmark the permalink.